There are certain toys based on the concept of LED lights. There is a way in the field of electronics to waterproof LED lights and this concept is now being used to make waterproof LED light toys. 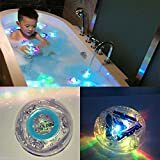 It would really even encourage toddlers to take a bath in a bath tub, when they would see such light glittering toys inside the water. Here are two such toys as below. 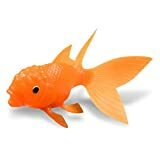 This toy is a flexible and fluffy fish which lit up when placed inside the water. This toy is based on the concept of LED lights as I mentioned above. Actually this is something very new for anyone to watch a fish emitting light inside the water while inside the water. And this fish is so flexible and elastic that children would love to take it in their hands and sometimes in their mouth. But this is harmless as it cannot be eaten or swallowed due to its elastic nature. It actually floats in the water and not just that it will go and settle at the bottom of the pool or bath tub. The color of the light inside this fish toy also changes from time to time when inside the water. There is a sealed compartment inside the body of the fish where the LED light and the batteries are safely placed but the batteries need to be recharged after every 40 hours. Here is a nice video telling more about this unique and awesome product. Basically the children enjoy this koi fish by inserting it in water for the lights to illuminate and than again taking it out of the water for the lights to go off. It can't be better than that, if your child needs all the great fun while bathing. Its quite realistic and durable. This toy is made from plastic material of high quality but its flexible as the plastic used is of elastic nature. But its in round shape like a ball. Its colorful and it works on the same principle of LED lights as mentioned in no.1 above. The price mentioned on Amazon is the price of each ball but the picture shows several such toys in the bath tub. So make sure to buy more than 1 piece so that the bath tub looks filled with such toys as in the picture. The functioning of this toy is same as the one mentioned above and batteries are required for their operation. These ball like toys will start sparkling inside the water in different colors once dispersed in the water. If the bathroom has no lights and if it is closed from all sides, the illuminated scene will look much better in the bath tub. These bath toys can be used in any water reservoir like swimming pool, fish tank etc and not necessarily the bathtub. Its functioning will remain same at all places. Just the right toys to encourage kids to take bath those who do not want to take bath. This toothbrush holder device will excite your child to brush his teeth everyday as a smartphone game can be played where brushing the teeth in different directions in the mouth will act as keys for the game.